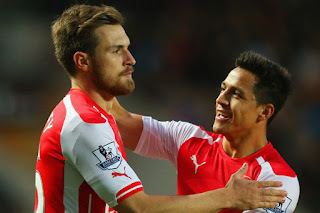 Home / aaron ramsey / Alexis Sanchez / arsenal fc / manchester united / Sanchez for Ramsey swap deal? Sanchez for Ramsey swap deal? After watching Arsenal struggle to beat Bournemouth, I couldn’t help but think that the Gunners need someone like Alexis Sanchez back in the line up. Surely Manchester United would be open to offloading the misfiring and unhappy Chilean, who might find his feet again by returning to Arsenal. To sweeten the deal, the Gunners could throw in contract rebel, Aaron Ramsey. That would make it a good bit of business for all concerned. With Lacazette out injured, Arsenal looked blunt in attack. Aubemayang eventually got the winner, though, sliding in to convert Kolasinac’s cross. That was the Bosnian’s second assist, although no one in Arsenal colours could be credited with the spectacular finish. Ultimately, it doesn’t matter how they go in, so the Gunners were grateful for the own goal. Meanwhile, defensively they looked shaky. A three-man defense rarely looks rock solid and that was the case as Sokratis, in particular, struggled. At the other end, Mkhitaryan was reminding Arsenal of how they ended up short-changed by the swap deal that saw Alexis leave last January. It feels like unfinished business, so maybe Arsenal will bring the Chilean back and offload bit-part player Ramsey. Now some tough fixtures beckon, so Arsenal fans will hope for Lacazette’s return so that they can continue this impressive unbeaten run.